There are three things that are certain to happen in the next couple months here in Montana. Sheep will be shorn, lambs will be born, and ranchers will have problems with predators. The last thing a cattle or sheep rancher wants to find when they are working hard to make a living is a calf or lamb killed by a predator. This is where a county cattle or sheep petition with USDA Wildlife Services comes into play and can make a difference. Before 1995, the Department of Livestock, the Montana Wool Growers Association, and the federal government paid for predator management. Over the years, sheep numbers declined so much that there wasn't enough money for the program. It came to a point where there was a significant increase in predation on calves in the areas where nearby sheep ranches had sold out. At the time, almost one-third of the predator management program was being paid for by sheep producers. Presently, that number is down to just over 3 percent. In 1995, the reintroduction of wolves sparked legislation that was passed to allow cattle producers to develop their own petition program for predator management. Sheep petitions have been available since 1943. Signing a county petition is completely voluntary for cattle and sheep producers. When the county residents owning at least 51 percent of the cattle in the county (as shown on the property tax records) have signed the petition, then the county Commissioners are able to collect an annual per capita based on the numbers that you report. Cattle petition funds are collected from all cattle owners in the county and the same applies to sheep owners and sheep petitions. Once the money is collected, it is sent to either the Montana Stockgrowers Association account or the Montana Wool Growers account through which Wildlife Services has signature authority. The money moves through these organizations strictly as a vehicle and is designated specifically for predator control with Wildlife Services. Even if a producer isn't a member of MWGA or MSGA, their money is still collected in the same way. Cattle and/or sheep producers in any county can initiate the county petition process, taking action to directly reduce livestock losses in their area of operation. One hundred percent of the money collected from the cattle petition (or sheep petition) is used by Wildlife Services for predator management in the Montana county where the petition money was collected. USDA Wildlife Services is a non-profit organization. The money collected from the cattle and/or sheep petition allows Wildlife Services to use aircraft (helicopters and planes) for aerial predator management. The funds collected also support the use of a Wildlife Services Specialist. If the funds collected aren't used up in the same year, the money carries over to the next year and are kept in that county. Wildlife Services charges $570/hour to fly to conduct aerial predator management for counties with cattle petitions. Individuals can also hire a private enterprise (not Wildlife Services) to conduct aerial predator management with the cost being around $1,100 per hour. If you privately set up a contract with Wildlife Services, 15.75 percent of that money goes to administrative and infrastructure fees that are already included in the cattle petition. The price of a contract set up in this way is slightly higher because of the added fees. If you pay into the petition, 100 percent of the money stays in Montana and goes to "on ground" and aerial services. Montana has 17 Wildlife Services Specialists that cover 53 counties. One specialist usually covers multiple counties. There are four cooperating counties that currently don't have a specialist. The specialist positions in these counties were vacated and since those counties don't have a cattle petition, there isn't enough funding available to replace those positions. The specialists' main job is to go out and help people on the ground with predation measures such as setting snares, M-44s, traps, etc. In the case that there is livestock killed, the specialists are the ones that determine if the livestock was killed by a predator, and if it was, they also help determine what type of predator killed the livestock, which is especially important in the cases of wolf and grizzly bear areas. If an area is having difficulties with a specific predator species, Wildlife Services work to manage the situation to reduce livestock losses. With federal funding for Wildlife Services declining over the last few years, cattle and sheep ranchers are coming to realize the importance of having a county cattle and/or sheep petition for predator management. Counties that don't have a petition or a specialist are on their own as far as predator management goes. According to Wildlife Services data, predation goes up in those areas that don't have a cattle petition or a specialist. Wildlife Services has noticed that when a specialist retires or leaves a county permanently, many of the agreements between WS and the producer are lost because there is no one there to work with the ranchers. Using aerial predator management and working on the ground, Wildlife Services is working to prevent ranchers from losing calves and lambs. In Montana, there are 48 sheep petitions that come to Wildlife Services. Under those petitions, 132,042 adult sheep are protected. This only includes adult sheep over the age of 9 months that are listed on the tax role, meaning that we also protect the lambs not listed in this number. There are 27 cattle petitions in the state of Montana that come to Wildlife Services. Under those petitions, 1,007,316 adult cattle are protected. Again, this number does not include calves under the age of 9 months, which are also protected. Carter County also has a both a sheep and cattle petition but does not go through Wildlife Services. Their petition protects 64,553 cattle and 22,210 sheep. Powder River County has both a cattle and sheep petition set up in the same way. Their petition provides protection for 69,563 cattle and 9,218 sheep. While there are several different types of predator management, aerial predator management is one of the most effective ways of reducing the population of coyotes in an area. Ranchers often rely heavily on Wildlife Services for their help with predator management both on the ground and from the air. With the price of cattle up in recent years, the help that a rancher receives with predator management as a result of the county cattle and/or sheep petitions can be of great value in the long run. 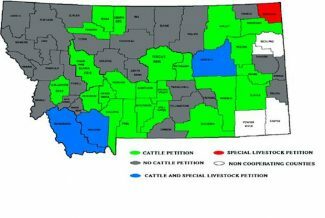 If you are interested in starting the cattle petition process in your county, please contact John Steuber with Wildlife Services at (406) 696-1932 or the Montana Wool Growers Association at (406) 450-3429.